A canker sore on the gum can be a real nuisance. These small, round open sores, also known as aphthous ulcers, generally have a white or yellow center with a red rim and they can make eating and drinking rather uncomfortable. About 25% of the population gets these annoying little sores and they seem to be more common in women. Applying a product like Orajel Ultra Mouth Sore Medicine or Orabase works pretty well to numb the pain and protect it from irritation. Below are several treatment suggestions including some home made mouth rinses that can help with the pain and promote healing. Canker sores are not contagious or cancerous, but their cause is not fully understood. Canker sores on the gum in particular may occurs after dental work such as a root canal or other dental procedures where the gum gets rubbed or irritated. It appears they are also sometimes triggered by stress, an injury to the mouth from a loose orthodontic wire or aggressive brushing or other trauma, a blip in the immune system, a nutritional deficiency and in some cases they have even be tied to a woman’s menstrual cycle. Some people are prone to canker sores and get them from biting their tongue, inside cheek or eating something with rough edges like tortilla chips that pokes and irritates the inside of mouth. For others, eating certain foods like chocolate, tomatoes, vinegar and pineapple can trigger a mouth ulcer. A diet deficient in vitamin B-12, zinc, folate (folic acid) or iron may also be a cause, or an intestinal problem such as Crohn’s disease or ulcerative colitis may make you more disposed to getting canker sores, especially if you get them frequently. In some people canker sores can be especially painful and aggravating, especially in sensitive places like the gum area by the inside of the upper or lower lip. Ouch! So if you have a sore on your gum you are probably looking for some kind of relief. You can usually lessen the pain and speed the healing with a variety of home remedies or inexpensive over-the-counter treatments. Favored home treatments include mouth rinses of half water and half hydrogen peroxide or a teaspoon of baking soda mixed in half a cup warm water, a dab of milk of magnesia directly on the sore several times a day, or vitamin E oil applied to the ulcer. Aloe vera gel can be very soothing and may also help your sore gum heal faster. Just be sure to get pure aloe without additives, which can sting. Some people find that making a paste with a little baking soda and water and applying it to the gum helps relieve the pain and help it heal faster. Pastes are a bit tricky to get to adhere inside the mouth, so you may need to apply it several times, and be sure to avoid eating or drinking so it doesn’t wash away. At the drugstore you can find products containing benzocaine such as Anbesol Maximum Strength Oral Anesthetic Gel Instant Pain Relief Gel that can help numb the area and temporarily relieve the pain. Dissolving discs like Cankermelts Medicated Discs that adhere to the sore and form a protective coating can be helpful, especially for the gum area. Antimicrobial mouth rinses including Orajel Antiseptic Mouth Sore Rinse may also supply some relief. If you have especially stubborn canker sores that won’t go away or they are extraordinarily painful, you may want to see your doctor. He or she may prescribe a special mouth rinse or topical paste. In extreme cases anti-inflammatory drugs such as prednisone may be necessary. While you have a canker sore you should stay away from spicy foods and acidic foods such as tomatoes, strawberries and citrus, as they may irritate the sore and make it burn. Canker sores differ from cold sores, also known as fever blisters. Both can be painful and recur, but canker sores only occur on the inside of the mouth and you can’t spread them to other people. Cold sores, on the other hand, occur on the outside of the mouth, i.e. the lips, cheeks and nostril area and are caused by a virus, HSV-1. Cold sores are quite contagious, while canker sores cannot be spread to others or to other areas of the body. 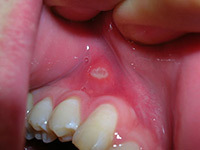 The good news is that painful canker sore on your gums will go away soon, even without treatment. The pain usually peaks in 2 or three days and then diminishes. It usually completely heals within 7 to 10 days.